Last August, Bank of America agreed to pay out nearly $17 billion to settle sixteen lawsuits over making and marketing fraudulent mortgages leading up to the start of the Great Recession, setting a record in the process. But the details, under the False Claims Act, remained sealed until last week. The big news, according to the Wall Street Journal, was just how much four whistleblowers were getting: $170 million plus. Even after the IRS and lawyers get their share, those four will enjoy a more comfortable lifestyle for a long time. Three individuals and a small New Jersey mortgage company, Mortgage Now, will share the spoils. Mortgage Now will receive $8.5 million for its part in exposing the fraud of issuing high-risk mortgages and calling them safe. Robert Madsen, a former employee with a property appraisal company owned by Bank of America, will get $56 million, while Shareef Abdou, a former Countrywide manager, will receive $48 million. Edward O’Donnell, a former Countrywide executive, will collect $58 million. Each of them helped attorney Brian Mahany piece together the gigantic fraud so he could sell it to the Justice Department. There was the “Hustle” program inside Countrywide where poor-credit risks borrowers were shuffled to be given loans they couldn’t afford. There were inflated appraisals to justify making the loans, generating nice fees to Countrywide. Mortgage Now in turn sold off the mortgages to the FHA while Countrywide sold MBSs to Fannie Mae and Freddie Mac. All of which is going to help make “whistleblower attorney” Mahany wealthy in the process, as the details will no doubt be added to his book, Saints, Sinners & Heroes: Covert Ops in the War Against the C-Suite Mafia, before it gets released in March. Doctors and billing clerks who stand up against shady hospital billing practices, loan underwriters who expose bad loan practices, construction foremen who blow the whistle on bridges being built with inferior steel … these are ordinary folks who decided to do something extraordinary. They risk their jobs, friends, and careers to do what is right with no guarantee that they will receive a penny. A whistleblower attorney is a gatekeeper. To qualify for a whistleblower award under the federal False Claims Act, an actual lawsuit has to be filed…. Much work goes into investigating claims, researching the law and drafting the complaint. Once filed, the suit needs to be “sold” to the government. The Justice Department and federal agencies [already] have a full plate…. Our job as whistleblower attorneys is to package these cases, provide key information to get the government’s investigation started, make the case understandable, and explain why it is worthwhile [for them] to pursue it. 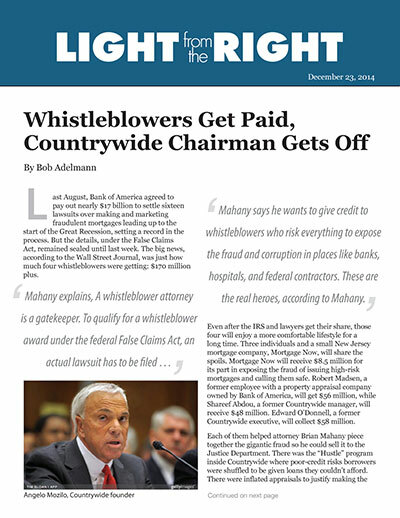 Missing from any of the public discussion over the announcement last week was the one scoundrel who got away with sums that make these whistleblower payouts seem tame by comparison: the chief miscreant in charge of Countrywide, Angelo Mozilo. The son of a butcher, Mozilo met his mentor, David Loeb, while getting his BS degree from Fordham. Upon graduation the two started a mortgage business and learned quickly just how profitable it was, especially if corners were cut. Early on he resisted the temptation to issue loans to poor credit risks, but they just went to his competitors instead. By the early ’90s he chucked his morals and started doing the same. The simple reason is that when the loan resets in five years there will be enormous payment shock and the borrower is not sufficiently sophisticated to truly understand the consequences…. Then the bank will be dealing with foreclosure in potentially a deflated real estate market. This would be both a financial and reputational catastrophe. Bank of America has acknowledged that, in the years leading up to the financial crisis that devastated our economy in 2008, it, Merrill Lynch, and Countrywide sold billions of dollars of RMBS [residential mortgage-backed securities] backed by toxic loans whose quality and level of risk they knowingly misrepresented to investors and the U.S. government. Top executives of the insolvent companies walked away with their personal fortunes intact. The executives had hand-picked their boards of directors, which handed out billions in bonuses after the government bailout. Between 2001 and 2006, Mozilo’s total compensation nearly reached half a billion dollars. When the SEC caught up with him, they allowed him to settle for a small fraction of his net worth: $67.5 million. Plus Mozilo was banned for life from serving as an officer or director of any publicly-traded company. Plus Mozilo was allowed to avoid admitting any guilt. Plus the SEC allowed Countrywide to pay $20 million of his penalty. Now that all the numbers have been revealed, it’s safe to say that the whistleblowers will be able to improve their lifestyles, and Brian Mahany’s law practice is likely to do very well indeed as the word gets around and his book gets published. As far is Mozilo is concerned, he has become invisible, enjoying the biggest payout of all.